You know, when it comes to big episodes -- in the case of The Walking Dead, the mid-season finale -- you can theorize and try to anticipate some of the worst scenarios as much as you want, but nothing really prepares you for it when it happens. Such is the case for the close of tonight's mid-season finale, "Coda." Major-major spoilers if you haven't watched the episode yet. We knew something big was coming. There had been clues, not to mention too many close calls and too few casualties, given all of the issues Rick and his group have dealt with during these first eight episodes. There was a good chance someone was going to die during "Coda," and sure enough, it came to pass. Rest in Peace Beth. This may be the first time I legitimately teared up during an episode of The Walking Dead. Chalk that up to a combination of the gut-wrenching shock of seeing Beth shot, the sight of Daryl carrying her lifeless body out of the hospital, and Maggie's reaction when she saw her sister. Let's talk about Maggie for a second, as I may have misinterpreted her lack of interest in rescuing her sister as indifference. Perhaps, it was just a matter of her being convinced that Beth was certainly dead, and Maggie was choosing to grieve silently, or not grieve at all in order to function. 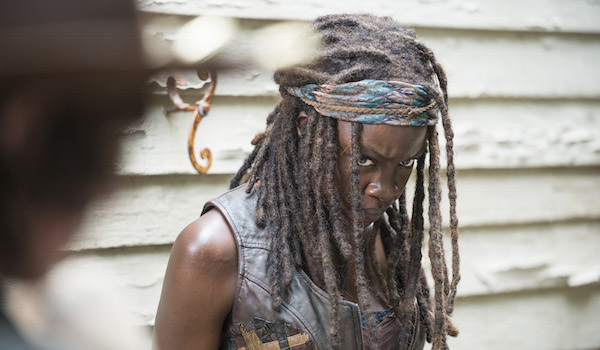 The way she reached when Michonne told her Beth was alive suggested she didn't believe there was a chance of that. So imagine her joy in learning that her sister was alive and her people were on their way to get her... only to arrive at the hospital to find Beth dead. So... did she do that on purpose? I definitely don't think Dawn shot Beth on purpose. And obviously Beth stabbed Dawn on purpose. But I am under the impression that Beth also knew there was a good chance she was going to die fighting. My initial reaction to the situation was that Beth didn't see the risk she was taking, in stabbing a woman with a loaded gun pointed at her. But upon further consideration, it seems like she'd be very foolish to do that and not think there was a good chance she was going to take a bullet for it. So I'm inclined to believe Beth knew what she was doing, which seems more confirmed when we consider her final words "I get it." I don't want to believe that she wanted to die. Maybe this was her way of giving her own life to save Noah's and anyone else who wanted to leave. Maybe she just found a way to gain some control over the situation and do something that really mattered. 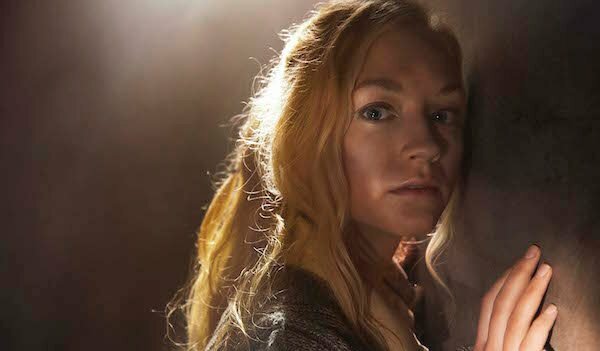 Beth wasn't my favorite character when she was first introduced, but her kindness and the strength and hope she developed in the past couple of seasons made her a ray of light in an otherwise dismal world. I'll miss her. I'm sure Daryl, Maggie, Noah and the others will too. And speaking of taking control. The moment Beth died, Daryl and Rick both stepped forward to take Dawn out. Deal is off. By the look on Dawn's face, she knew what was about to happen and there wasn't enough time in the world for her to talk her way out of it. That corridor could've been a bloodbath if everyone had started firing, but with Dawn gone, there was no reason to battle. It was over. It's hard to feel much connection toward the issues Dawn and her people have dealt with. We don't know them well. But if nothing more, the Atlanta hospital survivors are yet another example of people trying to get by in this horrible reality. As Beth pointed out, everyone there was using everyone to get what they wanted. The system that was in place might've worked at the beginning, but it wasn't working at this point. There were too many problems and too much doubt and distrust between the people of authority, and it was probably just a matter of time before it all collapsed. Beth wasn't the only casualty of tonight's episode. As mentioned, Dawn was killed off and Rick invited anyone from her group that wanted to leave to join them. Lamson met his demise at the hands (also gun and car) of Rick, who ran him down with a cop car then shot him. This is the Rick Grimes we now know. He said stop, the guy didn't stop, so he hit him. Another casualty of the episode is Dawn's guy O'Donnell. The moment he shoved that elderly man for not sewing good enough, I knew for sure he'd have a gross encounter of the worst kind with some walkers. I was mostly right. After brawling with Dawn, O'Donnell was shoved down the elevator shaft, where whatever was left of him was presumably devoured by the rattling walkers we heard down that way. That elevator shaft was just waiting for someone to get shoved through it. Really, Gabriel? Last week, Gabriel wormed his way out of the church to return to the school where he found Bob's leg, only to return with a pack of hungry walkers. It's a good thing Carl and Michonne have enough decency in them to let the man back into the church, basically undoing all of the hard work they put in when they secured the place. But Gabriel made it through the ordeal without a scratch, and he even found the courage to hold the door shut so that Michonne, Carl and Judith could get out of the church. Rick's group is now mostly reunited, as Abraham returned with his firetruck and saved Carl, Michonne, Judith and Gabriel at the church, before they set off for the hospital. Carol still doesn't look so good, but I'm guessing she's on the mend. And the episode closed out with Morgan entering the walker-abandoned church. What's his deal and how long before he finally catches up with Rick and his people? The Walking Dead returns for the second half of Season 5 in February 2015.